Our gift voucher program offers you the opportunity to get a loved one a gift they’ll actually love. We provide vouchers from €25 right up to €175. No matter the occasion we'll have the appropriately priced voucher for you. If you want to treat the woman in your life to a hair stylist’s treatment by one of Ireland’s premier hair salons, fill out our simple online form today. 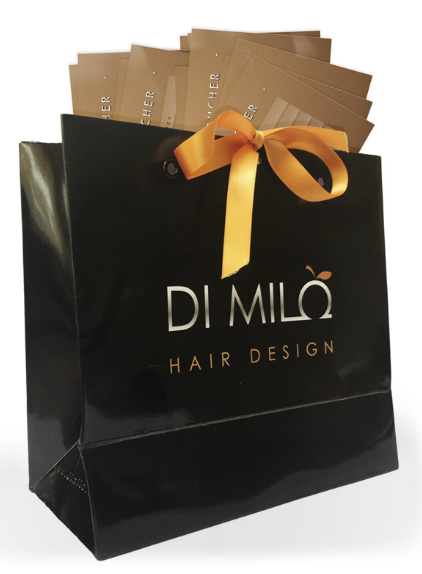 A Di Milo Hair Design voucher is perfect for birthdays, anniversaries, as a Christmas gift or simply to say thank you. Our completely secure voucher system affords you peace of mind along with a thoughtful gift that the receiver is sure to love. Get the perfect gift today, by filling out our simple gift voucher form. Call the salon now 01 2180872 and with will make up your voucher and if required, we will send it by post to address chosen by you.